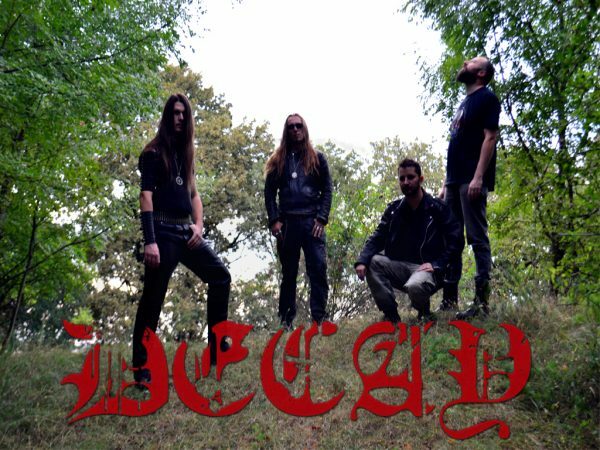 The band DECAY was founded in 1996 at the initiative of two brothers: Hunor “Goat” Csuvar (voice) and Levente “Rat” Csuvar (guitar). The idea was to compose something new and original for the metal scene, combining their preferences for doom, death and black metal (Goat), punk and grunge (Rat). Along with the two brothers, came Roland Szabo on drums and Alexandru “Jackson” Varga on bass. The guy dealing with the lyrics was Goat and the instrumental part came back to Rat. The first concert was in Oradea, later invited to perform several concerts in the western part of the country. This chapter ends in 1999, after which the band collapsed. In 2004, the two brothers reunited to compose their first demo entitled “Vortex of Thoughts“, the guitar and drums being composed by Rat. Milcomete “Vampy” Iulian joined the band on bass. The tracks on this demo had nothing in common with the other tracks made up of the old formula in 1999. In 2013, Goat was invited to join a new band where he met guitarist Zoltan Gergely. And this band had a pretty fast breakdown, but Goat kept in touch with Zoli, resuming the idea of the old DECAY project. New members came, but they also left, leaving only Goat with Zoli. In 2014 a few new songs were composed and after a period of silence everything seemed to end for this project initiated by the Csuvar brothers. It followed a few years with many component changes. 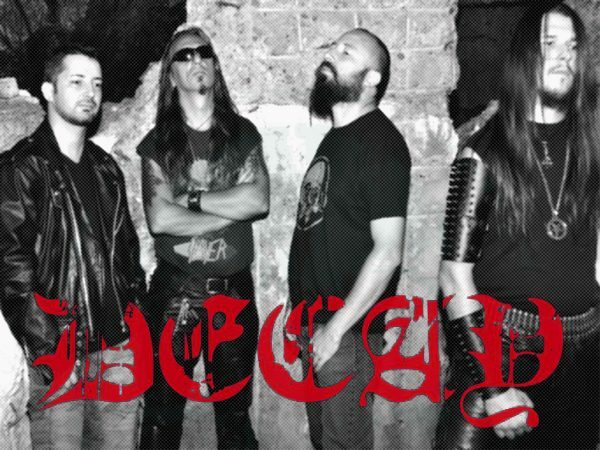 With the exception of the vocalist Goat, many new members joined the band: Miklos Adam, Vlad Tuta and Barnabas Darai (ex Igfon) on the drums, Levente Kibedi and Nagy Levente Imre (ex Igfon) on guitar, Cristi Gheorghiu on bass. In 2016 Tudor Francu (Franky), (ex Tenebros), came to bass guitar and in 2017 the guitar was taken over by Robert “Cölöp” Barabas (ex Igfon). 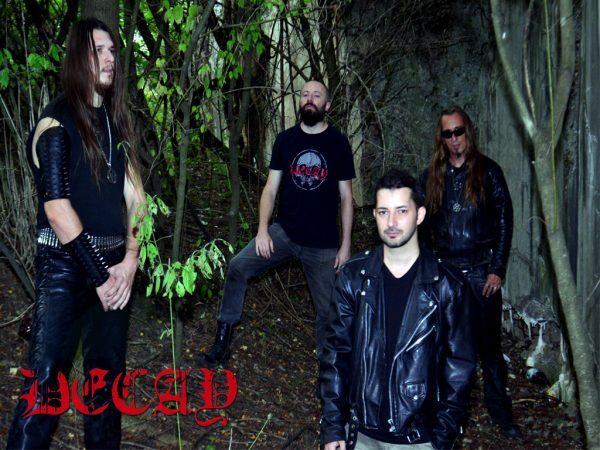 The current line-up (2018) is completed by Zoltan Gergely returning to the band, but this time as a drummer, bringing his experience as guitarist. 2016-2018 represented for the band a period of affirmation on the local scene in Oradea. There have been many concerts, as opening act, with well-known bands of the metal scene: Negura Bunget, Gothic, Prong, Katara, Kazakh, Integral Vortex, etc. An important step for the band was the participation in the Magura Fest 2017. The lyrics belong to the vocalist of the band and capture experiences and thoughts about death, dehumanization, misanthropy and occultism. The lyrics are focused on human instincts and phobias, exploring the occult side of existence, the primordial forces that govern nature. DECAY is a state of mind that highlights “the dark side of reality”, “the dark side of existence” … Time degrades matter and spirit. There is not an absolute apocalyptic ending but a perpetual and permanent transformation, a repetition of existential cycles in which good and evil coexist. Rise and decadence succeed in the unwritten law of an uncontrollable destiny.